In this book Greg gets a picture from his uncle, but instead of saying thank you he's seas "Really thins is what you got me." Just from this little sentence I could tell that Greg is a very selfish person and he only cares about himself. Greg also has a friend named Rowly and he is very strange he like's to play with girl toys and he has a pink bike. And then you have Greg's parents there like normal parents but they want Greg to get out more like go out side and play because all they ever see him doing is watching T.V. 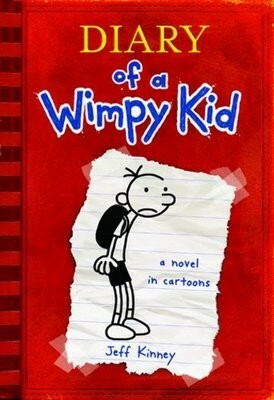 or playing video games.Greg also has two brothers Many and Rodrick they don't play a big part in the book but there the kid of brothers that are mean to Greg.Greg is always trying to get people to like him so he try's to come up with ideas for people to like him more. The theme of this story is be thankful for what you have and be grateful that you have it. my book is first person limited . I know because in the book it seas I, my, me, we and there is only one person trying to solve the conflict. and throw the ball to Rowly, but then after that all I could hear was Rowlys bellowing. It was as loud as a cop siren and as annoying as a hamster on his wheel that would never stop running.
" When I get older I will be famous and when I am I wont have time to answer peoples stupid questions all the time. So this book will come in handy." I chose this dialogue because it really shows the reader that Greg is not that caring of a person he only cares about himself.